Outside of the Old Saloon #10 a man dressed in stereotypical cowboy gear is sitting on a bench. He suggests I come inside, as they are about to do a reenactment of the death of Wild Bill Hickok. I take his advice, mostly because that is exactly what I have come to see. 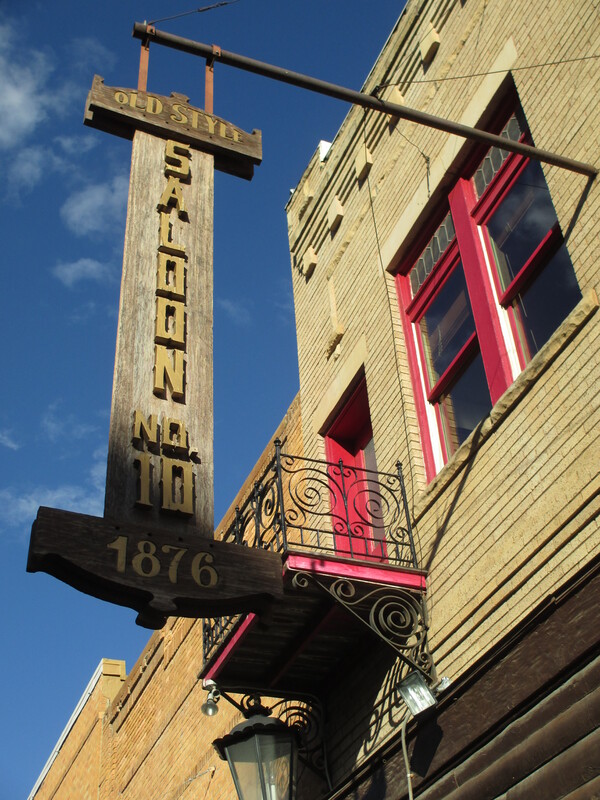 Prior to my arrival in town some 20 minutes earlier, all I knew about Deadwood, South Dakota was that Stephen Tobolosky was once in a TV show of the same name. With about an hour to kill in town, I figure I might as well find out what killed Wild Bill. Inside the bar a waitress directs me to the back room and I take a seat at an empty table. She asks what I want to drink. The true answer is “nothing,” but that seems rude. “I’ll have a Roy Rogers,” I tell her. A crowd starts to form and the tables began to fill up. The cowboy comes in and asks for four volunteers. Two people raise their hands. Slowly a third joins. I don’t want to volunteer, but I can’t stand to see a presenter try to work a dead crowd. I raise my hand. The cowboy takes the four of us behind a curtain to put on our oversized costumes. The only man in the group is given the job of bartender and told to stand in the back of the scene pretending to fix drinks. The cowboy turns to the rest of us and asks if we know how to play poker. I say I know a little. The short brunette shakes her head no, and the skinny blonde seems terrified by the question. The cowboy tells us it doesn’t matter, we just have to pretend. The blonde is turned into a steamboat captain and told she should pretend to get shot in the arm when the gun is fired. The brunette is appointed saloon owner. My character has an actual name and a line to say at the end, which I assume is given to me because I am the only one who isn’t staring blankly like she’s about to be hit by a bus. The cowboy leaves to do the intro, and both women turn to me with fear in their eyes. “So you know how to play poker?” the brunette asks. “We can just pretend,” I tell them. “We’ll pull cards and when you get a bunch that match you can lay them down like you won.” I know it’s not accurate, but I figure it will be easier to do than learn poker in 30 seconds, and it should look good on stage. The women nod. 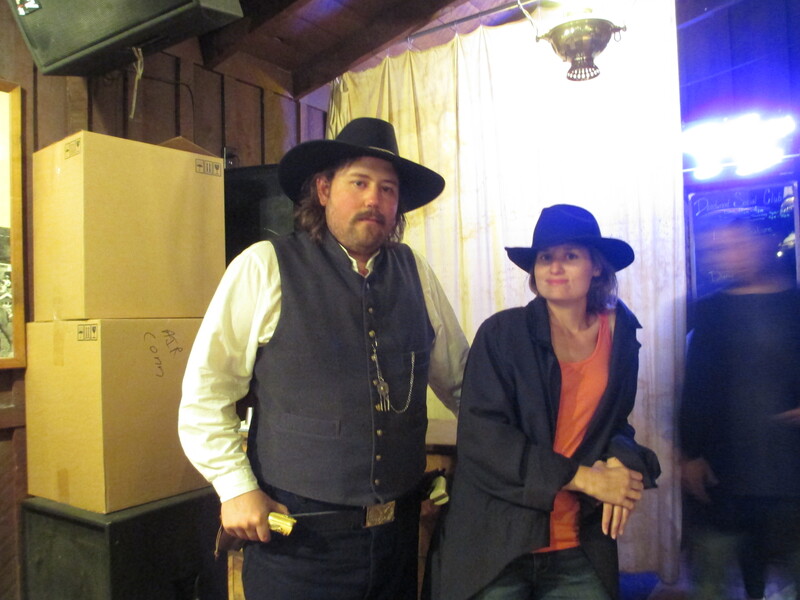 The cowboy has us come out one by one, each time introducing our characters and explaining what brought us to Deadwood. I don’t hear much because I’m focused on getting to the right spot and setting out our newly acquired props. I sit at the table with the two women and shuffle the cards. They are still confused and nervous, and I keep having to point at them to get them to draw more cards or throw in chips. I look at my hand, slowly replacing good cards with bad. Before long I lay down a flush, and we shuffle again. The cowboy is still talking, setting the scene and telling the crowd about his character: Wild Bill Hickok. I don’t hear anything he says because I’m trying to get the girls to keep moving cards and chips around. I get a straight and lay down my cards again. “You’re good at this,” the blonde steamboat captain whispers to me. Thanks. I made up the rules myself. The cowboy leaves for a moment to switch from narrator to Bill. The same waitress who took my order comes up to the table. “Anyone wanna buy me a drink?” she asks in character. The two girls don’t even look up, they’re so focused on our mythical version of Gin Rummy. The cowboy didn’t say anything about the waitress, so I shake my head no. I can hear it in her voice. Something is supposed to happen here, and she needs one of us to give her the cue. “Okay, I’ll buy you one,” I say. There’s an awkward pause. “Can I have one of your chips then?” she presses, pointing at the table. Ah, so that’s what she’s after. I hand her a chip and she takes it to our fake bartender to buy a fake drink. The real show starts when Wild Bill walks into the scene and joins us for a round of cards. His assassin, Jack McCall, enters a short time later. The two have something of an altercation, but I’m not paying attention because a saloon owner and a sea captain keep looking at me to know what they should do next. I can hear the tension mounting between the two real actors, and Wild Bill turns his back to the future killer. The blonde chooses this moment to finally lay down a flush. Wild Bill whispers to her to keep her cards up, and she looks at me confused, as she was pretty sure this was a winning hand. I nod in agreement but motion that she should keep going anyway. She pulls her cards back up. 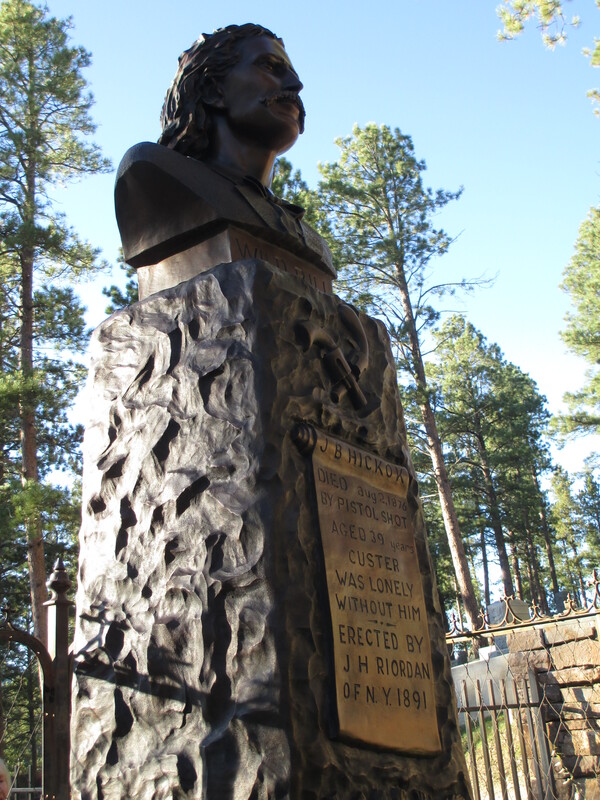 Wild Bill Hickok is shot in the back. As the actor falls to the floor the three of us jump out of our seats. I say my line and we all run after the murderer. Backstage the sea captain remembers she was supposed to get shot. Both girls are smiling and jittery, and I smugly consider the underrated benefits of my $60,000 theater degree. We walk back out to take our bows. The waitress has thankfully forgotten to get my Roy Rogers. I leave the bar and head over to my car, ready to get back out on the open road. I still have no idea why Wild Bill Hickok was shot. This entry was posted in Attractions, History and tagged Deadwood, Historical Reenactment, improv, poker, Wild Bill Hickok. Bookmark the permalink.